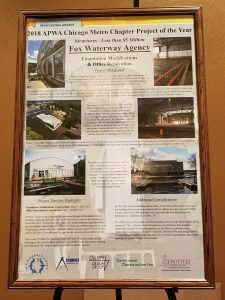 On January 16, 2018, the Fox Waterway Agency (FWA) was awarded the 2018 APWA Lake Branch Chapter Project of the Year for Structures – Less Than $5 Million for their Foundation Modification and Office Renovations Project. 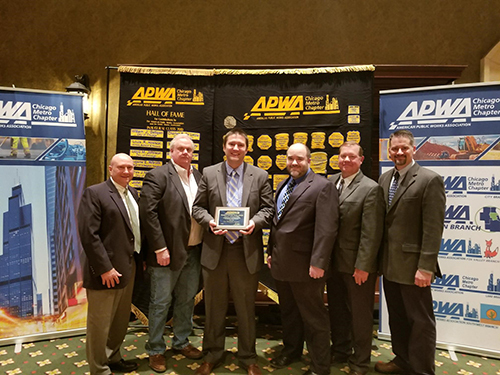 More recently, the FWA was also awarded the 2018 APWA Chicago Metro Chapter Project of the Year award in the same category. To accept and celebrate the award, on Friday, March 16, 2018, Trotter and Associates, Inc. (TAI) attended the APWA Chicago Metro Chapter Awards Luncheon with representatives from the Fox Waterway Agency, Gillespie Design Group, Schmidt Engineering, Inc., and Carmichael Construction Inc. Acknowledging the difference people make in life is a powerful action. The APWA Awards program was established to recognize outstanding individuals, groups, and organizations representing the best in the public works profession. By recognizing professional contributions, public works professionals promote an atmosphere of mutual respect and provide a way to grow and achieve. We would like to thank everyone involved in the project, APWA and the awards committee, for the recognition.